With the launch of Moon in Google Earth today, you can now explore our nearest celestial neighbor from within Google Earth. Beginning in 1959, we began to send probes and landers to the lunar surface, and most of them remain there to this day. Many of these objects have been modeled in Google SketchUp, and are based on drawings, photographs, and dimensions. 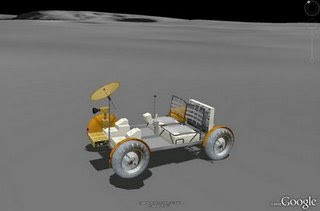 One model that has a prolific presence on the Moon comes from Google 3D Warehouse model contributor, Pagan. This user modeled theApollo Lunar Module and it is featured at each of the Apollo mission landing sites, as well as in the guided tours. 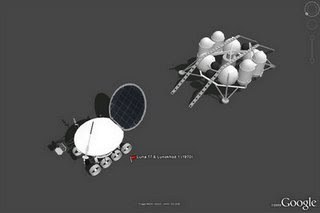 To view these models in Google Earth, first switch to Moon via the planetary drop-down menu at the top of the screen. Next, expand the "Moon Gallery" in the left Layers panel. 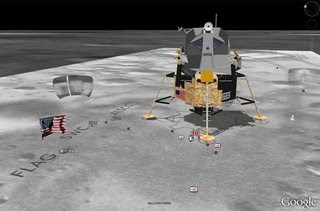 You can also view these models in SketchUp by downloading them from our Moon Objects collection in the Google 3D Warehouse. Happy exploring!